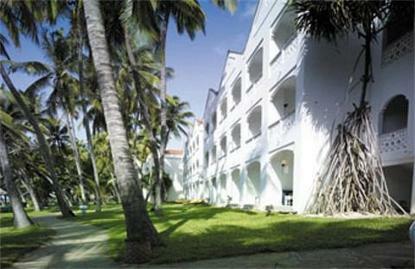 Sarova Whitesands Beach Resort is East Africa's largest and best known resort. It is located on Bamburi Beach, on the North Coast of Mombasa. A fusion of Swahili interiors and Arabic architecture, the resort is spread over 22 acres of exquisite gardens and has the largest beach front on the north coast overlooking an ocean teeming with unique marine life.Choose from a range of standard, sea front, palm and suite accommodation all with their own balconies or terraces and views of the pool or the sea. The rooms are equipped with en suite bathrooms, air conditioning, direct dial phones, mini bars and satellite TV.Dining options at Sarova Whitesands are a true gourmet delight. The Pavilions restaurant features daily international buffets including themed nights. The Lido-Fish on the beach combines a breath taking sea front location with the freshest seafood on the coast. Minazi the 24 hour casual dining restaurant offers a range of popular international cuisine including kiln baked italian pizzas and refreshing options of freshly squeezed juices, smoothies, ice creams and special coffees.Tulia, our health and wellness center provides Ayurvedic holistic treatments as well as Western and Oriental therapies. Our Ayurveda therapists from India will provide you with traditional healing while our western therapies are sure to re energize you and help you to relax and rejuvenate your body and spirit.The resort has several animation activities for children through out the day as well as child care facilities in the evening. Entertainment options include Cocos at the beach front for a night of music and dancing or large screen sporting action at Tamanisha Sports Lounge. Outdoor activities include lawn and table tennis, a choice of four swimming pools and a range of water sports activities including jet skiing, wind surfing, snorkelling, scuba diving and much more exciting water action.Sarova Whitesands is a paradise by the ocean.